Sally Davenport has a background in the physical sciences having started academic life as a research chemist. She moved into the business world while working as a consultant in Britain in the late 1980s. She returned to New Zealand to take up a position teaching the management of science & technology. Her research interests now cover the growth of innovative firms, the commercialisation of science and collaboration between researchers and business, and high-tech entrepreneurship and incubators. Being in Wellington, has also developed interests in research and innovation policy. Sally has been an investigator on three major grants investigating competitive advantage in New Zealand’s high-tech firms, and networks and relationships in New Zealand’s biotechnology sector. She was the leader of the project “Building Our Productivity – Understanding Sustainable Collective Productivity in New Zealand Firms”. On the basis of this research, Sally was appointed as a Commissioner with the New Zealand Productivity Commission in 2011. 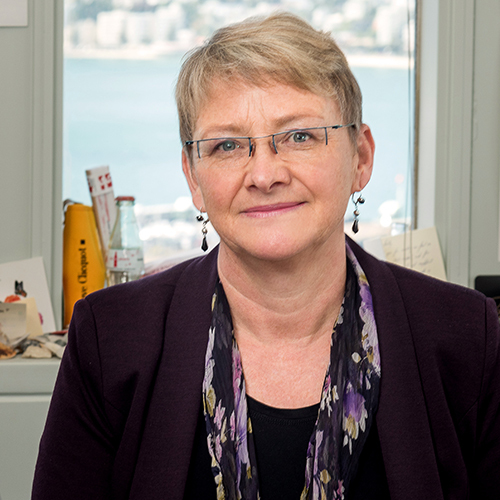 Sally is also involved with two Centres of Research Excellence, as an Emeritus Investigator with the MacDiarmid Institute for Advanced Materials and Nanotechnology and as a Principal Investigator with Te Punaha Matatini. Most recently Sally joined the management team of the National Science Challenge: “Science for Technological Innovation” (SfTI) where she was the portfolio leader for “Building New Zealand’s Innovation Capacity. In February 2017, Sally because the Director for the SfTI challenge. Sally has authored a range of refereed publications covering topics from technology management to strategic discourse, and her papers have appeared in journals such as Organization Studies, Human Relations, Research Policy, R&D Management, Science & Public Policy, Discourse Studies, European Planning Studies and Innovation: Management, Policy & Practice. She is an Adjunct Professor with the College of Business & Economics at the Australian National University, a Fellow of the International Society for Professional Innovation Management and a member of Global Women. Renton, M., Daellenbach, U., & Davenport, S. Finding fit: An exploratory look at SME brand orientation and brand management in the New Zealand food and beverage sector. Journal of Brand Management, 2016, 23(3), 289-305. Renton, M., U. Daellenbach, S. Davenport & J. Richard, Small but Sophisticated: Entrepreneurial Marketing and SME Approaches to Brand Management, Journal of Research in Marketing and Entrepreneurship, 2015, 17(2), 149-164. Leitch S, Motion J, Merlot E & S. Davenport, The Fall of Research and Rise of Innovation: Changes in New Zealand Science Policy Discourse, Science and Public Policy, 2014, 41, 119-130. Cummings, S., U. Daellenbach, S. Davenport and C. Campbell. ‘Problem-sourcing’: A Re-framing of Open Innovation for R&D organisations, Management Research Review, 2013, 36(10), 955-974. Motion, J., S. Davenport, S. Leitch & E. Merlot, Corporate Reputation and the Discipline of Public Relations. In The Handbook of Communication and Corporate Reputation, C. Carroll (ed), Wiley-Blackwell, Chichester, UK, 2013, chp 7, 62-71. Daellenbach, U. & S. Davenport, Making a Virtual Research Centre “Real”: How Social Capital Formation facilitates Organizational Identity Construction in a Virtual Organization. In Social Capital: Theory, Measurement, Outcomes, Nova Publishers, Hauppauge, NY, 2013, chp 17, 363-387. Davenport, S., S. Cummings, U. Daellenbach & C. Campbell, ‘Problemsourcing: Local Open Innovation for R&D Organisations’, Technology & Innovation Management Review, 2013, March, 14-20. Davenport, S. & S. Leitch, What Makes a Stakeholder Act? Exploring the Impact of the Issue in the Stakeholder Relationship. In A Stakeholder Approach to Corporate Social Responsibility: Pressures, Conflicts, Reconciliation, A. Lindgreen, P Kotler, F. Manon & J. Vanhamme (eds), Gower Publishing, 2012, chapter 2, 25-43. Leitch, S. & Davenport, S. Identity as a Constraint and Enabler: The Role of Front Organizations in Achieving Societal Change, European Journal of Marketing, 45 (9/10), 2011, 501-520. Davenport, S. & Daellenbach, U.‘Belonging’ to a Virtual Research Centre: Exploring the Influence of Social Capital Formation Processes on Member Identification in a Virtual Organization, British Journal of Management, 22 (1), 2011, 54-76. Davenport, S. and Leitch, S. Creating Space for the Successor: The Discourse Strategies of Pro- and Anti-GM Factions Regarding the Future of Agriculture in New Zealand, European Planning Studies, 17(7), 2009, 943-961. Ahn, M. Meeks, M. & Davenport, S. Death of Distance? : Biotechnology Agglomeration Patterns, Alliance Proximity, and Firm Performance, International Journal of Innovation and Technology Management, 6(3), 2009, 247-264. Ahn, M., Meeks, M., Davenport, S. and Bednarek, R. Exploring Technology Agglomeration Patterns for Multi-national Pharmaceutical and Biotechnology Firms, Journal of Commercial Biotechnology, 2009, 1-16. Leitch, S. and Davenport, S. Corporate brands and Social Brands: Co-branding GM-free and UK supermarkets, International Studies in Management and Organization, 37 (4), 2008, 45-63. Davenport, S. and Bibby, D. Contestability and Contested Stability: The Life and Times of CSIRO's New Zealand Cousins, the Crown Research Institutes, Innovation: Management, Policy & Practice, 9, 2007, 181-191. Leitch, S. and Davenport, S. Strategic Ambiguity as a Discourse Practice: The Role of Keywords in the Discourse on ‘Sustainable’ Biotechnology, Discourse Studies, 9 (1), 2007, 43-61. Leitch, S. and Davenport, S. Talking with the Silent Majority: An Interest-Identity Framework, Public Relations Review, 32(1), 2006, 71-73. Davenport, S. and Leitch, S. Circuits of Power in Practice: Strategic Ambiguity as Authority Delegation, Organization Studies, 26(11), 2005, 1603-1623. Leitch, S. and Davenport, S. The Politics of Discourse: The Marketisation of the New Zealand Science and Innovation System, Human Relations, 58(7), 2005, 891-912. Davenport, S. Exploring the Role of Proximity in SME Knowledge Acquisition, Research Policy, 34(5), 2005, 683-701. Davenport, S. and Leitch, S. Agoras, Ancient and Modern, and a Framework for Science-Society Debate, Science & Public Policy, 32(2), 2005, 137-153. Davenport, S. Panic and Panacea: Brain Drain and Science and Technology Human Capital Policy, Research Policy, 33(4), 2004, 617-630. Daellenbach, U. and Davenport, S., Establishing Trust During the Formation of Technology Alliances, Journal of Technology Transfer, 29, 2004, 187-202. Davenport, S., Campbell-Hunt C. and Solomon, J. The Dynamics of Technology Strategy: An Exploratory Study, R&D Management, 33(5), 2003, 481-499. Davenport, S. Leitch, S. and Rip A. The ‘User’ in Research Funding Negotiation Processes, Science & Public Policy, 30(4), 2003, 239-250. Leitch, S. and Davenport, S. Strategic Ambiguity in Communicating Public Sector Change, The Journal of Communication Management, 7(2), 2002, 129-149. Davenport, S. Carr, A. and Bibby, D.Leveraging Talent: Spin-off Strategy at Industrial Research, R&D Management, 32(3) 2002, 241-254. Davenport, S. and Miller, A. The Formation and Evolution of International Research Alliances in Emergent Technologies: Research Issues, Journal of High Technology Management Research, 11(2), 2000, 199-213. Davenport S. Grimes C. and Davies J. Collaboration and Organisational Learning: A Study of a New Zealand Collaborative Research Programme, International Journal of Technology Management, vol 18(3/4), 1999, 173-187. Davenport, S. Grimes, C. and Davies, J. Collaborative Research Programmes: Building Trust from Difference, Technovation, 19(1), 1999, 31-40. Davenport S. Grimes, C. and Davies, J. Research Collaboration and Behavioural Additionality: A New Zealand Case Study, Technology Analysis & Strategic Management, 10(1), 1998, 55-67. Davenport, S. & Leitch, S. What Makes a Stakeholder Act? Exploring the Impact of the Issue in the Stakeholder Relationship, in A Stakeholder Approach to Corporate Social Responsibility: Pressures, Conflicts, Reconciliation, A. Lindgreen, P Kotler, F. Manon & J. Vanhamme (eds), Gower Publishing, 2012, 25-43. Davenport, S. and Leitch, S., Circuits of Power in Practice: Strategic Ambiguity as Authority Delegation, SAGE Directions in Organization Studies, Clegg, S. (ed), London, Sage, 2010, Vol. 4, chp 69, 295-316. Davenport, S. & Leitch, S. The Role of Boundary Organisations in Maintaining Separation in the Triple Helix, in Viale, R. & Etzkowitz, H. (Eds) The Capitalization of Knowledge: A Triple Helix of University-Industry-Government Relations, Cheltenham, UK: Edward Elgar, 2010, 243-260. Davenport, S. To Cluster or Not to Cluster? The Growth of High-Tech Firms in New Zealand. In Innovation Networks and Knowledge Clusters, Carayannis, E., Assimakopoulos, D. & Kondo, M. (eds). Basingstoke: Palgrave, 2007. 361-383. Davenport, S. The Entrepreneur has 'Sold Out': An Exploratory Study of the Sale of High-Tech Companies to Off-shore Buyers. In Challenges in the Management of Technology, Management of Technology vol. 1. Horlesberger, M., El-Nawawi, M, & Khalil, T. (eds). 2007. (Collection of best papers from IAMOT (International Association for the Management of Technology) Conference, Vienna, Austria, May 2005). Campbell-Hunt, C. Brocklesby, J. Chetty, S. Corbett, L. Davenport, S. Jones, D. and Walsh, P. World Famous in New Zealand: How New Zealand’s Leading Firms Became World-class Competitors. Auckland: Auckland University Press, 2001. Davenport, S. and Campbell-Hunt, C. Technology and Innovation, in Yeabsley, J. (ed) Global Player? Benchmarking New Zealand’s Competitive Upgrade, NZIER Research Monograph 67, 85-100, 2001. Hubbard, G. Morkel, A. Beamish, P. & Davenport, S. Cases in Strategic Management: Australia & New Zealand, new edition, Prentice Hall, 2000. Hubbard, G. Morkel, A., Beamish, P. & Davenport, S. Cases in Strategic Management: Australia & New Zealand, Instructor’s Manual, 3rd edition (CD/ROM) Prentice Hall, 2000. Davenport, S. & Leitch, S. The Role of Boundary Organisations in Maintaining Separation in the Triple Helix, V Triple Helix Proceedings (11 best papers), Edward Elgar. Ahn, M. Ackerley, D. Davenport, S. & Bednarek, R. Global Alliances for Biotechnology Researh, Develoment, and Commercialisation: Industrial Research Limited (IRL) in: Dunn, W., Hunter, I., Morris, K. (Eds) New Zealand Case Series: Innovation and Entrepreneurship in New Zealand, Melbourne, McGraw-Hill. Ahn, M. Davenport, S. Ackerley,A. & Bednarek, R. Industrial Research Limited: New Zealand-Based Biopharmaceutical Entrepreneurship, The Management Case Study Journal, 8 (1), 51-70, 2008. Davenport, S. Technology Transfer Society 2006 Annual Conference ((conference report) Innovation: Management, Policy & Practice, 9(1), 2007, 90. Davenport, S. The Australian and New Zealand Academy of Management (ANZAM) Conference (conference report) Innovation: Management, Policy & Practice, 9(1), 2007, 91. Davenport, S. Triple Helix VI: Conference on University, Industry and Government Linkages (conference report) Innovation: Management, Policy & Practice, 9(1), 2007, 91-92. Davenport, S. XVII Annual ISPIM Conference (conference report) Innovation: Management, Policy & Practice, 8(4-5), 2006,418. Davenport, S. The Joint 4S & EASST Conference (conference report) Innovation: Management, Policy & Practice, 7(4), 2005, 479. Davenport, S., The 24th International Strategic Management Society Conference (conference report) Innovation: Management, Policy & Practice, 7(4), 2005, 480. Davenport, S. The 5th Triple Helix Conference (conference report) Innovation: Management, Policy & Practice, 7(4), 2005, 481. Davenport, S. The 14th International Conference on the Management of Technology (conference report) Innovation: Management, Policy & Practice, 7(4), 2005, 481. Davenport, S. The Academy of Management Annual Meeting (conference report) Innovation: Management, Policy & Practice, 6(3), 2004, 476. Davenport, S. Annual Meeting of the Society for the Social Studies of Science (4S) (conference report) Innovation: Management, Policy & Practice, 6(2), 2004, 366. Davenport, S. The R&D Management Conference 2003 (conference report) Innovation: Management, Policy & Practice, 6(1), 2004, 127. Davenport, S., The Australian and New Zealand Academy of Management (ANZAM) Conference (conference report Innovation: Management, Policy & Practice, 6(1), 2004, 128. Davenport, S. Images of Strategy (book review), R&D Management, 34(5), 2004, 622-624. Davenport, S. R&D Management/ANZAM (conference report), Innovation: Management, Policy & Practice, 2004, 127-128. Davenport, S. and Daellenbach, U. Innovative Networks – Cooperation in National Innovation Systems (book review), R&D Management, 33 (3), 2003, 355-357. Davenport, S. Daellenbach, U. and Davies, J. In This Issue (introduction to special issue), R&D Management, 32(3) 2002,177-178. Davenport, S. and Ball, D. Leveraging Research and Technology (conference report), R&D Management, 31(3) 2001,349. Davenport, S. Leitch, S. Motion, J and Renton, M. Mobilizing Scientific Discourse to Rebrand Organizational Identity,European Group for Organization Studies (EGOS) Conference, Barcelona, July 2009. Davenport, S. and Leitch,S. Organizing Ambiguity: Intent and Choice in Sensemaking, Process Organization Studies Symposium, Cyprus, June 2009. Davenport, S. and Daellenbach, U. Connecting Innovators to Create Organizational Identity for a Virtual Research Centre, International Society for Professional Innovation Management (ISPIM) Symposium, Singapore, December, 2008. Leitch, S. Motion, J. and Davenport, S. Community Engagement and Resistance: A Discourse Perspective, Australian & New Zealand Academy of Management (ANZAM Conference), Auckland, December 2008. Bryson, J. Renton, M. Davenport, S. Dallenbach, U. Leitch, S. & Motion, J. (2008). Mapping the Firm-level Productivity Terrain. Presentation at the Labour, Employment and Workplace conference, Wellington, December 2008. Davenport, S. Entrepreneurial Exit Strategy: Exploring the Decision to Exit by Trade Sale, Academy of Management Conference, Anaheim, August 2008. Davenport, S. & Leitch, S. Theorizing the Relational Role of Strategic Ambiguity in Changing Others, European Group for Organization Studies (EGOS) Conference, Amsterdam, July 2008. Davenport, S. & Daellenbach, U. The Paradox of Platforms: Exploring Business Models in High-Tech Start-Ups, International Society for Professional Innovation Management (ISPIM) Conference, Tours, June, 2008. Leitch, S. & Davenport, S. No Past – No Future: The Political Advantages of an Ever-Present Organizational Identity, Academy of Management Conference, Philadelphia, August, 2007 (short-listed for best paper prize, Critical Management Studies Interest Group). Davenport, S. Leitch, S. & Motion, J. Denying Social Capital: The Role of Boundary Organizations in creating Inter-Organizational Demarcation, Australian & New Zealand Academy of Management (ANZAM Conference), December 2007. Davenport, S. Daellenbach, U. & Torkkeli, M. Hi-Tech Start-Up Resources as Potential Productivity Signals, Australian & New Zealand Academy of Management (ANZAM Conference), December 2007. Motion, J. Leitch, S. & Davenport, S. Political Power Plays and Purse Power: Resistance and Rebellion as Reverse Colonization, European Group of Organization Studies (EGOS) conference, Vienna, July 2007. Davenport, S. Innovation for Growth: Signalling Potential Productivity in Hi-Tech Start-Ups, International Society for Professional Innovation Management conference, Warsaw, June 2007. Davenport, S. & Bibby, D. (2007). Contestability and Contested Stability: Unpacking Unease in the Triple Helix, Triple Helix Conference, Singapore, May. Davenport, S. & Leitch, S. Pragmatically Understanding Stakeholder Mobilization and Action, Australia and New Zealand Academy of Management Conference, Queensland, December, 2006. Davenport, S. & Daellenbach, U. (2006, November). Collaboration, proximity and identity: A study of ‘being’ central or peripheral in a multi-institution research centre. MOPAN ’06 Multi-Organizational Partnerships, Alliances and Networks, Wellington, New Zealand. Davenport, S. Technology Transfer by Takeover: Reframing a Nation’s ‘Loss’ of High-Tech Companies Through Off-shore Acquisition, Conference of the Technology Transfer Society, Atlanta, September, 2006. Davenport, S. & Daellenbach, U. Making a Virtual Research Centre ‘Real’: The Role of Social Capital Formation in Organizational Identity Construction, European Group of Organization Studies (EGOS) conference, Bergen, July 2006. Davenport, S. Innovation Networks: practice is Far More Interesting than Theory, keynote paper, International Society for Professional Innovation Management conference, Athens, June 2006. Davenport, S. & Daellenbach, U. Building a Nano-Nation: The Role of the MacDiarmid Institute, PRIME Nanodistrict Workshop, Grenoble, March, 2006. Davenport, S. & Leitch, S. What Makes a Stakeholder Act: Adding the Issue into Stakeholder Mobilization Theory, Academy of Management Conference, Hawaii, 2005. Davenport, S. & Leitch, S. Sustainable Ambiguity, Enabling Stakeholder Interaction Through Multiple Sustainability Discourses, part of Showcase Symposium, Competing Claims: Critical Perspectives on ‘Sustainability’ and Biotechnology (Organisers: Elmes & Davenport), Academy of Management Conference, Hawaii, 2005. Leitch, S. & Davenport, S. Keeping Our Distance: The Role of Front Organizations in Achieving Societal Change, Critical Management Studies Conference, Cambridge, July 2005. Davenport, S. & Leitch, S. Articulating Past Glories: Discursive Struggle for New Zealand’s Agricultural Future, European Group for Organization Studies conference, Berlin, July 2005. (Note: also a stream convenor for this conference). Davenport S. & Leitch, S. The Role of Boundary Organisations in Maintaining Separation in the Triple Helix, Triple Helix 5 Conference, Turin, Italy, May 2005. Davenport, S. The Entrepreneur has 'Sold Out': An Exploratory Study of the Sale of High-Tech Companies to Off-shore Buyers, IAMOT (International Association for the Management of Technology) Conference, Vienna, Austria, May 2005. Leitch, S. Davenport, S.& Motion, J. Issues, Interests and Identity: Communicating Biotechnology, Technology, Between Enthusiasm and Resistance (TEER) conference, Jyvaskyla, Finland, May, 2005. Davenport, S. The Founder is Going Fishing: An Exploratory Study of New Zealand High-Tech Company Sales to Offshore Buyers, ANZAM (Australia & New Zealand Academy of Management) Conference, Dunedin, December, 2004 (refereed paper section). Davenport, S. Leitch, S.& Daellenbach, U. Balancing Interest and Identity: Adding the Issue to Stakeholder Mobilization Theory, Strategic Management Society (SMS) Conference, Puerto Rico, October 2004. Leitch, S. & Davenport, S. Creating Controversy Through Consultation, presented at European Association for the Study of Science & Technology (EASST), Paris, August, 2004. Davenport, S. & Leitch, S. We Are What We Grow: Discursive Strategies of Organic and GE Food Production Systems, part of Showcase Symposium presented at the Academy of Management Conference, New Orleans, August 2004. Daellenbach, U. and Davenport, S. Cultures and Customers: A Stakeholder Perspective on the Aftermath of a Technology-based Merger, presented at the International Association for Management of Technology Conference, Washington DC, April 2004. Davenport, S. Proximity and Knowledge Acquisition Preferences in SMEs, presented at ANZAM (Australia & New Zealand Academy of Management) Conference, Fremantle, December, 2003 (refereed paper section). Davenport, S. and Leitch, S. Agoral Gatherings, ELSI-fication and Genetic Modification, presented at the 4S (Society for Social Studies of Science) Conference Annual Meeting, Atlanta, October, 2003. Daellenbach, U. and Davenport, S. Changes in Organizational Culture Following Mergers: A Stakeholder Perspective, presented at the Academy of Management Conference, Seattle, August, 2003. Davenport, S. Cluster Theory and R&D Management in Small and Medium Sized Enterprises, presented at the R&D Management Conference, Manchester, July 2003. Leitch, S. and Davenport, S. Changing Organizations, Changing Discourses: The Transformation of the New Zealand Science and Innovation System, presented at the European Group for Organization Studies (EGOS) Conference, Copenhagen, July 2003. Leitch, S. and Davenport, S. Designing Discourse to Effect Organisational and Stakeholder Change, presented at the Australian and New Zealand Communication Association Conference, Queensland University of Technology, July 2003. Davenport S. SME Access to Technological Knowledge: Perhaps Proximity Doesn’t Matter?, Advances in the Economic and Social Analysis of Technology (ASEAT) Conference, April 2003. Davenport S. and Leitch, S. The ‘User’ Ideograph in Triple Helix Negotiation Processes, The 4th Triple Helix Conference, Copenhagen, November, 2002. Davenport, S. and Leitch, S. Strategic Ambiguity and Public Sector Management, International Federation of Scholarly Associations of Management (IFSAM) Conference, Brisbane, July 2002. Leitch, S. and Davenport, S., Strategic Ambiguity and the Transformation of the New Zealand Innovation System, Australian and New Zealand Communication Association Conference, Bond University, July 2002. Davenport, S. Rip, A. and Leitch S. Ideographs and Narrative Themes in the Politicisation of Technological Choices, European Group for Organizational Studies (EGOS) Conference, Barcelona, July, 2002. Davenport, S. Daellenbach, U. and Campbell-Hunt, C. The Growth of New Zealand Firms Through Extreme Events, Australia and New Zealand Academy of Management (ANZAM) Conference, Auckland, December 2001. Corbett, L. Brocklesby, J. Davenport, S. & Jones, D. Symposium: Growing World-Class Capability in New Zealand Firms, Australia and New Zealand Academy of Management (ANZAM) Conference, Auckland, December 2001. Davenport ,S. and Leitch S. Managing Scientific Stakeholders with Strategic Ambiguity, European Group for Organizational Studies (EGOS) Conference, Lyon, July, 2001. Davenport, S. U. Daellenbach and Campbell-Hunt, C. Extreme Events in the Odyssey of High Technology Firms, European Group for Organizational Studies (EGOS) Conference, Lyon, July, 2001. Davenport, S. Carr, A. and Bibby, D. Leveraging Talent: Spin-off Strategy at Industrial Research, The R&D Management Conference, Wellington, February, 2001, pp. 451-463 (CD/ROM). Davenport, S. and Campbell-Hunt, C. Going Global by Leveraging Technology, The R&D Management Conference, Wellington, February, 2001, pp. 234 (CD/ROM). Daellenbach, U. Davenport, S. and Davies, J. Leveraging Resources Through Alliances: The Role of Risk-Taking, Power, Reputation and Trust, The R&D Management Conference, Wellington, February, 2001, pp. 371 (CD/ROM). Brocklesby, J. Campbell-Hunt, C. Chetty, S. Corbett, L. Davies, J. Davenport, S. Jones, D. Symposium: The Evolution of Competitive Capability, The Australian and New Zealand Academy of Management (ANZAM) Conference, Macquarie University, Sydney, December 2000. Campbell-Hunt, C. Davenport, S. Corbett, L. Walsh, P. Jones, D. & Brocklesby, J. Symposium: Competing on the Arrow of Time, Academy of Management Conference, Toronto, August, 2000.